We stock a large range of women's titanium wedding rings in 3mm, 4mm and 5mm widths in both a traditional court design, or flat comfort fit. The finger sizes of the titanium wedding rings start at a UK size I in our 3mm rings, and UK size J in our 4mm & 5mm rings. 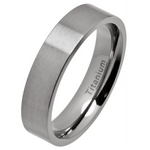 Each of the titanium wedding rings can be finished with a highly polished finish, or with a satin brushed finish. Our workshop is also able to customise each ring by setting brilliant cut diamonds, or a range of coloured gemstones, as well as engraving your personal message, or date of wedding. Our Titanium Rings in Small Finger Sizes have been rated 10 out of 10 based upon more than 88 customer reviews.